India Post – Punjab Circle recruiting under sports quota for the post of postal assistant, Sorting Assistant, Multi Tasking Staff (MTS). Interested and Eligible candidate can apply on or before 20th July 2015. 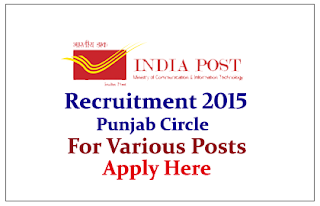 Company Profile: Punjab Postal Circle is headed by a Chief Postmaster General and work under guideline of Ministry of Communications & Information Technology. Further it is divided into regions, headed by a postmaster general and comprising field units known as divisions. PAs / SAs = Pay Band Rs. 5200-20200 +Grade Pay Rs.2400/- + allowances as admissible under Rules. How to Apply: Interested and eligible candidate can apply with neatly filled application with required documents to mentioned address in the official notification on or before 20.07.2015.Application form attached with official notification, For more details kindly check official notification.